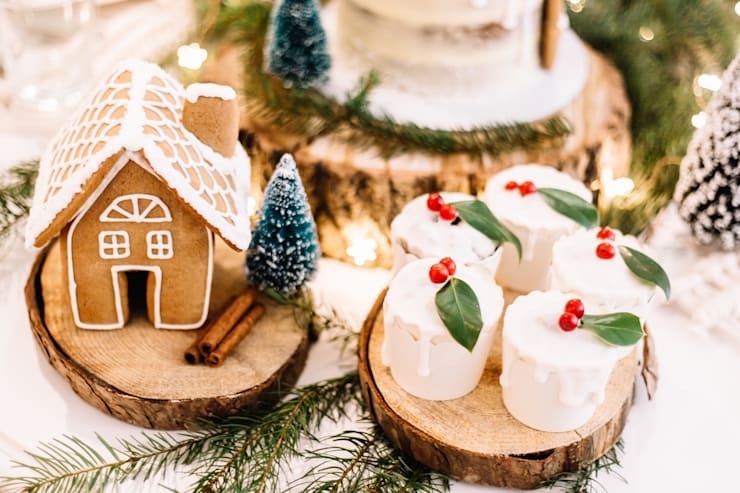 Christmas is undoubtedly a special time of year, but some of us really go overboard with décor and details – thousands of flickering lights, dancing reindeer, laughing Santas, glowing elves dangling from ceilings… you name it! But you want to know something? This is the one time of the year where more is more! The easiest and quickest source of inspiration for DIY Christmas décor? Mother Nature herself. 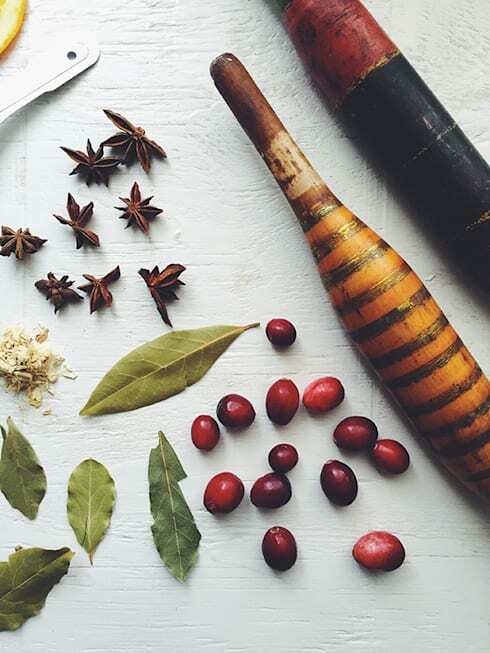 If you really want to have common holly (one of Christmas’ pure symbols) adorning your home but can’t find any (or refuse to pay for it), we have a little DIY trick up our stylish sleeves… All you’ll need is some bay leaves, cinnamon sticks, cinnamon sticks, and star anise – and your choice of fruit like apples, plums, pears, grapes, etc. 5. Glue all the pieces together and get creative with your designs! Definitely not a new trend and also not something that’s likely to go out of fashion anytime soon… Wooden bases for displaying Christmas décor, centrepieces for tables, stands for hot dishware, bases for bowls of festive sweets, cheese boards, etc. These can be purchased in the shops; however, if you want to go the DIY route (i.e. cutting them yourself), we recommend keeping safety in mind! How charming as these wooden boards serving as display stands? Want to keep the kids busy? Give each a circular base made from foam (which can be picked up at nurseries or flower shops, or DIY stores). Let them choose their own decorations such as pine cones, nuts, leaves, branches, etc. Hand each some glue (and safety gloves), clear the table, and have at it! The finished result could be as perfect as our example (ideal for a table centrepiece with a candle in the middle), or can be something much more unique and personal – your choice! Got an old plate lying around? Use it to create a beautiful Christmas centrepiece! If the plate is in white or gold (or red or green or any of the other colours usually associated with Christmas), even better. However, we are always up for designs that go against the norm – thus, if your table centrepiece is striking blue (or hot pink… ), have at it! Take your pick from your favourite Christmas decorations that didn’t make it to the tree this year. Items like pine cones, baubles, holly, candles, colourful ribbons, etc. 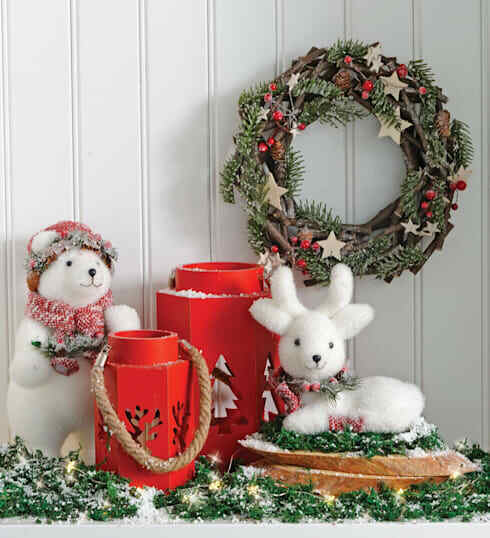 Combine your various choices and come up with one-of-a-kind designs to ensure your Christmas décor is most unique. 4. 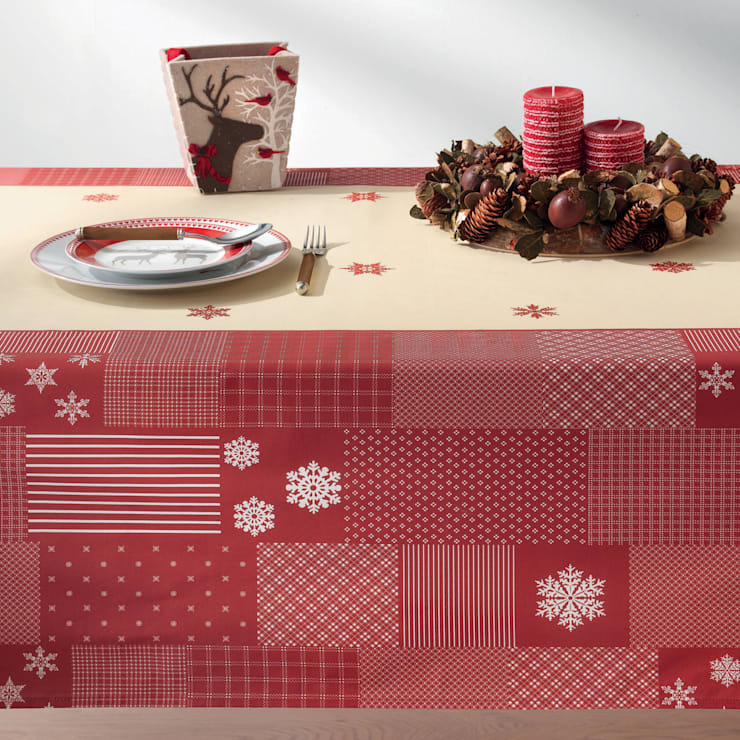 Place on your flat surfaces of choice (dinner table, windowsill… ) and enjoy! No time (or energy) for DIY Christmas décor? The least you can do is pick up a few green leaves or dried branches (make sure they’re still in relatively good condition) and use as table runners. It’s small and subtle, but trust us when say it makes a difference! The best kind of anything is the kind you can eat! And since no one is sticking to their diets during the festive season, have at it with some homemade cookies! Of course the end result is just more festive if said cookies are in special shapes like Christmas trees, reindeers, Santas, stars, etc. Another very easy thing you can do for some Christmas glow (literally) is pick up a few candles. Be smart with your colours – will it complement your table’s setting, for instance, or bring your fireplace mantel to life? Feel free to strew a few decorations in-between those candle stands (colourful baubles, pine cones), or tie some ribbons around them! 1. Prep your jars for use. Make sure they are clean and completely dry. 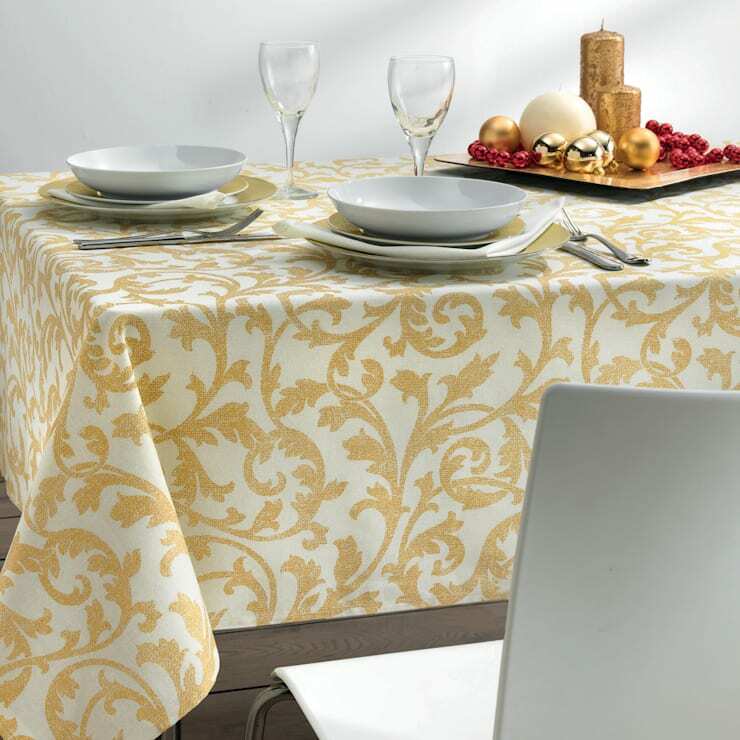 Place them on a sheet of wax paper to ensure that any wax that spills will be easy to clean up. 2. Insert a candle wick in the centre of each jar. If you are using wicks with wick clips (little metal disks on the end), the wicks should easily stand up straight. If you are using wicks without clips, just hold the wick in position by tying the top of the wick to a pencil and balancing the pencil across the top of the container. 3. Wax should always be heated in a double boiler for safety precautions, which is essentially a pan inside of a pan. Fill the bottom pan with water and then place the second pan (where the wax will go) inside of it. 4. Cut the wax into small pieces and place it in the pan-within-the-pan. Heat over medium heat until the wax has melted. 5. Want your candle to be a certain colour? Add bits of crayons to the wax and heat until melted. Continue adding bits of crayon until you’re happy with the colour – the more you add, the darker it will become. 6. Don't ever leave your stove unattended while the wax is heating! When the wax has melted completely, turn off your stove. 7. Use oven mitts or pot holders to carefully pour the wax into your jar until it reaches the top (or the desired height). 8. Give the wax a few hours to cool down – best is to leave it until it has completely hardened. 9. Once the wax has hardened, simply trim the wick down to size, and your candle is ready for use! 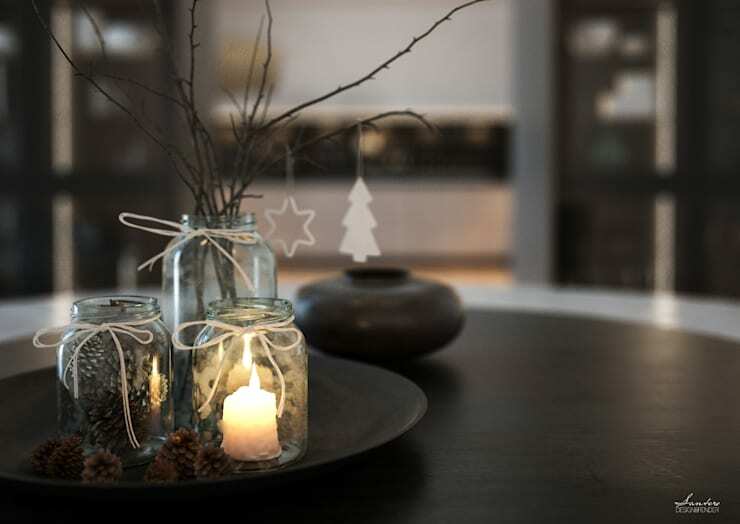 Want your home to look slightly different this festive season? See these 20 amazing alternatives to traditional Christmas trees.